Looking for a youth boat built for speed and excitement? Maybe a pathway towards the Olympics? The Nacra 15 offers just that to youth sailors around the world. This semi-foiling catamaran is one of the six boats endorsed by the Olympic Development Program. The whole idea of the Nacra 15 is to capture youth sailors and have them continue sailing for life. This doublehanded boat requires teamwork and is making sailing fun and exciting for youth sailors all over the world. The production of the Nacra 15 began in 2015 and was designed from scratch to the ISAF criteria so it could become the official ISAF youth catamaran. The purpose was to replace the older catamarans and create a new catamaran that had a more modern design along with the ability to hold more crew weight. 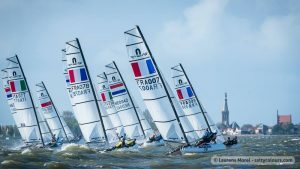 The Nacra 15 is a mini version of the Olympic Nacra 17, and thus creates a pathway towards the Olympics for youth sailors. The Nacra 15 plans on representing the future of cat sailing for youth around the world. The Nacra 15 is a semi-foiling catamaran which carries two curved daggerboards that provide lift. Less drag and more lift makes this boat faster and more exciting! The boat is 15.4 feet long and includes a mainsail, jib, and spinnaker. This official World Sailing youth multihull is exciting and fast but is safe for youth sailors. 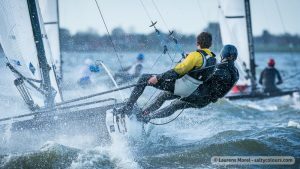 This boat is an excellent way for youth sailors to learn to work as a team. 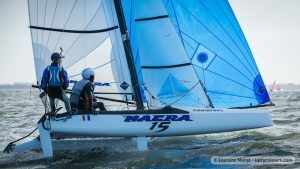 The Nacra 15 is one of the trainer boats in the Youth Olympic Development Program and serves as one of the pathways for youth sailors on a journey to the Olympics.